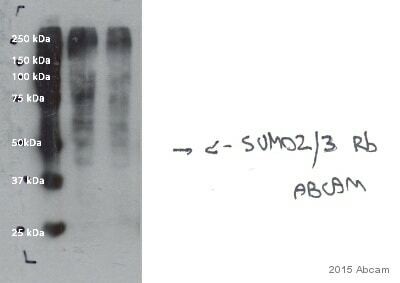 Recognises 2 bands representing Sumo 2 and Sumo 3 at 15 and 18kDa in Hela Nuclear extract by Western blotting. Synthetic peptide conjugated to KLH derived from within residues 50 to the C-terminus of Human Sumo 2+3. WB: HeLa Nuclear cell lysate. IHC-P: Human colon adenocarcinoma tissue. ICC-IF: HepG2 cells. Our Abpromise guarantee covers the use of ab3742 in the following tested applications. WB 1/1000. Detects a band of approximately 15, 18 kDa (predicted molecular weight: 11.6 , 10.8 kDa). SUMO proteins, such as Sumo 2 and Sumo 3, post-translationally modify numerous cellular proteins and affect their metabolism and function. However, unlike ubiquitination, which targets proteins for degradation, sumoylation participates in a number of cellular processes, such as nuclear transport, transcriptional regulation, apoptosis, and protein stability. Sumo 2 and Sumo 3 are highly homologous, hence it is very difficult to produce antibodies which distinguish them. Immunocytochemistry/ Immunofluorescence - Anti-Sumo 2+3 antibody (ab3742)Image from Cuchet-Lourenço D et al., PLoS Pathog. 2011;7(7):e1002123. Fig 9(B). ; doi: 10.1371/journal.ppat.1002123. Left-hand images show uninfected cells and the co-localization of SUMO-2/3 with PML (red) in control (upper rows of each block of 4 images) and PML depleted (low rows of each block of 4 images) HepaRG cells. Right-hand images show typical examples of recruitment of the indicated proteins to sites associated with HSV-1 genomes (ICP4; red) in cells at the edges of ICP0 null mutant (ΔICP0) plaques in control and PML depleted HepaRG cells. Scale bars indicate 5 µm. Cells on glass coverslips were fixed with 1.5% formaldehyde in PBS containing 2% sucrose then treated with 0.5% Nonidet P40 substitute in PBS/10% sucrose. SUMO-2/3 was detected with ab3742. An Alexa-conjugated anti-rabbit IgG was used as the secondary antibody. Predicted band sizes : 11.6 & 10. 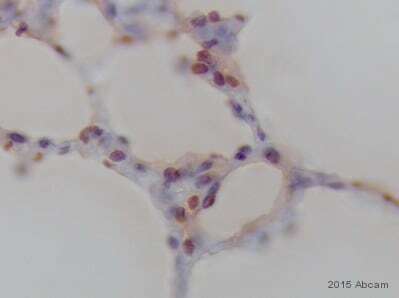 IHC image of Sumo 2+3 staining in human colon adenocarcinoma formalin fixed paraffin embedded tissue section, performed on a Leica BondTM system using the standard protocol F. The section was pre-treated using heat mediated antigen retrieval with sodium citrate buffer (pH6, epitope retrieval solution 1) for 20 mins. The section was then incubated with ab3742, 1µg/ml, for 15 mins at room temperature and detected using an HRP conjugated compact polymer system. DAB was used as the chromogen. The section was then counterstained with haematoxylin and mounted with DPX. ab3742 staining Sumo 2 + 3 in Human skin. The paraffin embedded human skin tissue was incubated with ab3742 (1/800 dilution) for 30 mins at room temperature. Antigen retrieval was performed by heat induction in citrate buffer pH 6. Ab3742 was tested in a tissue microarray (TMA) containing a wide range of normal and cancer tissues as well as a cell microarray consisting of a range of commonly used, well characterised human cell lines. 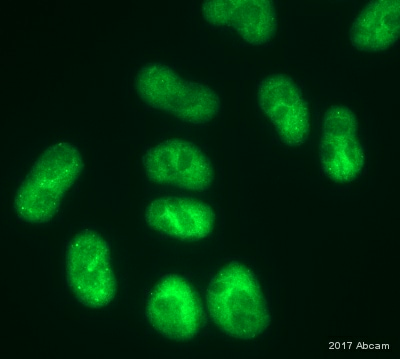 Immunofluorescent imaging of human cells (U2OS) with ab3742 confirms the specificity of this antibody. Antibody signal is localised exclusively to the nucleus, with diffuse background staining of the nucleoplasm. Intense foci of staining are also evident, corresponding to SUMO-2/3 accumulation in nuclear subdomains such as the PML body. This image is in exact agreement with several published reports (see for example Saitoh H et al.). IF was performed with a standard paraformaldehyde technique (fixed in PBS buffered PFH 4% for 5 minutes, permeabilised with 0.5% triton-PBS for 5 minutes, blocked with 5% milk / 0.2% tween for one hour. 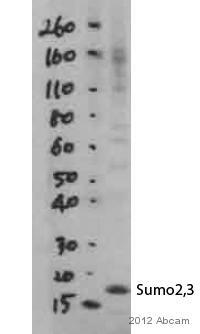 Primary antibody used at 1/100 in 5% milk / 0.2% TWEEN for one hour, secondary antibody for 30 minutes. All blocking and incubation steps carried out at 37 degrees. Nuclei are stained with Hoechst stain. ab3742 staining Sumo 2+3 in Xenopus laevis oocyte cell by ICC/IF (Immunocytochemistry/immunofluorescence). Cells were fixed with formaldehyde, permeabilized with NP-40 0.1% in PBS and blocked with 3% BSA for 60 minutes at 23°C. Samples were incubated with primary antibody (1/250 in PBS + 3% BSA) for 1 hour at 23°C. 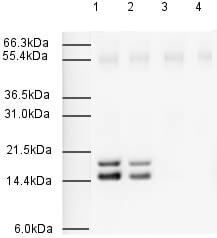 An undiluted Alexa Fluor®488-conjugated Goat anti-rabbit polyclonal was used as the secondary antibody.